CHICAGO -- Celebrating 25 years of saving lives nationwide, the American Cancer Society Making Strides Against Breast Cancer walks in October support the fight against the second leading cause of cancer death in women. The events fund breast cancer research and free programs and services for patients and their families. 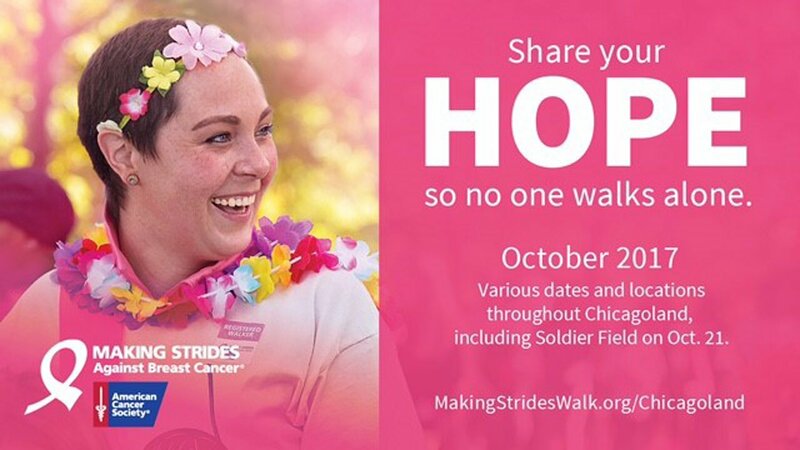 Teams and individuals may register in advance online at MakingStridesWalk.org/Chicagoland for the Oct. 21 event at Soldier Field, or for one of several other noncompetitive, inspirational walks. Held on various dates throughout October, National Breast Cancer Awareness Month, the events feature entertainment, fun activities, and special VIP tents for survivors and caregivers. ABC 7 Chicago's Roz Varon will be emceeing the event at Soldier Field. Onsite check-in/registration for this event opens at 8 a.m., with Opening Ceremony at 9 a.m. and step-off for the walk at 10 a.m. According to the American Cancer Society Cancer Facts & Figures 2017, an estimated 252,710 women in the United States will be diagnosed with breast cancer and 40,610 will die from the disease this year. To learn more about the Making Strides Against Breast Cancer event and how you can become involved, visit MakingStridesWalk.org/Chicagoland or contact Allyson Vaulx at ChicagoILStrides@cancer.org or (312) 279-7277.